A former head of the CIA slammed President Obama on Sunday for releasing four Bush-era memos, saying the new president has compromised national security. 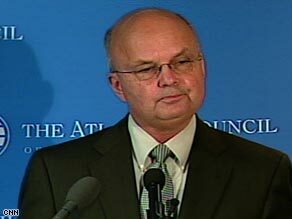 Michael Hayden, who served as former President Bush’s last CIA director from 2006 to 2009, said releasing the memos outlining terror interrogation methods emboldened terrorist groups such as al Qaeda. “What we have described for our enemies in the midst of a war are the outer limits that any American would ever go to in terms of interrogating an al Qaeda terrorist. That’s very valuable information,” Hayden said during an appearance on “Fox News Sunday.” “By taking [certain] techniques off the table, we have made it more difficult — in a whole host of circumstances I can imagine — for CIA officers to defend the nation.” But Sens. Claire McCaskill, D-Missouri, and Lindsey Graham, R-South Carolina, said certain techniques should not have been allowed in the first place. McCaskill called them “a great recruitment tool for those who want to do harm to our country.” White House Chief of Staff Rahm Emanuel dismissed Hayden’s assertion that releasing the memos had undermined U.S. intelligence efforts by giving al Qaeda critical new information. “One of the reasons the president was willing to let this information out was that already the information was out,” he said on ABC’s “This Week.” “Go get the New York Review of Books. It’s there.” Hayden said he called several senior White House officials to express his opposition before the president released the documents. Hayden also noted that four previous CIA directors, as well as current agency director Leon Panetta, opposed the release. The memos said, among other things, that interrogation tactics such as waterboarding, sleep deprivation and slapping did not violate laws against torture absent the intent to cause severe pain. Obama prohibited the use of so-called “enhanced interrogation techniques” such as waterboarding shortly after taking office in January. Such techniques “undermine our moral authority and do not make us safer,” he said Thursday, when the White House released the memos. As a result of the administration’s decision, Hayden argued, CIA officials will be less willing in the future to engage in interrogation tactics now sanctioned by the federal government. “The basic foundation of the legitimacy of the agency’s action has shifted from some durability of law to a product of the American political process. That puts agency officers in a horrible position,” he said. “The really dangerous effect of this [decision] is that you’ll have agency officers stepping back from the kinds of things that the nation expects them to do. … You’re going to have this agency — on the front line of defending you in this current war — playing back from the line.” Hayden also said — contrary to the assertions of many critics — that the interrogation techniques in question had forced suspected terrorists to reveal valuable information and made the country safer. He predicted that the release of the memos would be “just the beginning. … There will be more revelations, more commissions, there will be more investigations.” McCaskill, also appearing on “Fox News Sunday,” countered that the United States will be better off in the long run by clearly prohibiting interrogation techniques such as waterboarding.